Whitechapel, 1888: London is bowed under Jack the Ripper's reign of terror. Falkenberg, Sweden, 2015: a woman's body is found mutilated in a forest, her wounds identical to those of the Tower Hamlets victims. French crime writer Johana Gustawsson is a bit of a wolf in sheep's clothing. She takes readers into some terribly dark places, based upon real-life horrors from the past and contemporary nightmares, but she does it so elegantly with her flowing prose seasoned with humour you don't fully comprehend until later just how black (noir, in French) some of the content is in her crime novels. 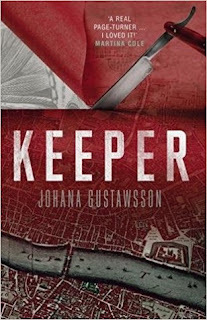 Following on from her excellent, award-winning debut, BLOCK 46, which blended contemporary crimes in Sweden and the UK with historic horrors from Buchenwald concentration camp, KEEPER sees the return of Canadian profiler Emily Roy and French true crime writer Alexis Castells in another disturbing case spanning borders and decades. This time Gustawsson takes readers back even further, to the late nineteenth century and one of the world's most notorious true crime sprees. Gustawsson adroitly weaves several threads together. It can be easy for a book that leaps about in time, place, and point of view as much as this one to feel disjointed, but KEEPER flows effortlessly, building tension as we learn more about both the past and present. Gustawsson does a particularly good job bringing late nineteenth century London to life, in all of its sour and infested 'glory'. For the majority of Londoners, life wasn't the genteel fantasy portrayed in some nostalgic period pieces, but instead a Dickensian life of sordid, grimy horrors and a hard-scrabble, cut-throat fight to survive. I liked this book a lot. It's a great read. Interestingly, I felt a little at a distance from Emily Roy and Alexis Castells, admiring and enjoying them as characters rather than feeling I was completely alongside them (yet), but this didn't take away from me thoroughly enjoying what is a terrific read. The connections between the UK and Sweden, which mirror Gustawsson's own life (she's a French writer married to a Swede, living in London), never feel forced or 'author hand', instead very smooth and authentic. It may surprise some to learn that one of Jack the Ripper's real-life victims was from Sweden (we forget, in our modern world of easy international travel, that many working-class people immigrated to new countries more than a century ago; it wasn't just famous explorers who roamed the world, even if the journeys back then were much harsher and took much longer than nowadays). Gustawsson does a great job bringing us into the lives of everyone involved, from the victims and families and investigators of the modern cases in London and Sweden, to the realities of living in Whitechapel at a time a brutal maniac was hunting women among the fluid-stained alleyways. A very good read. I look forward to more from Gustawsson, Roy, and Castells.